Cavium is filling out a scale gap in its Octeon III system-on-a-chip (SoC) range with he four-to-sixteen core CN72xx and CN73xx variants that are pin-compatible with the rest of the range. 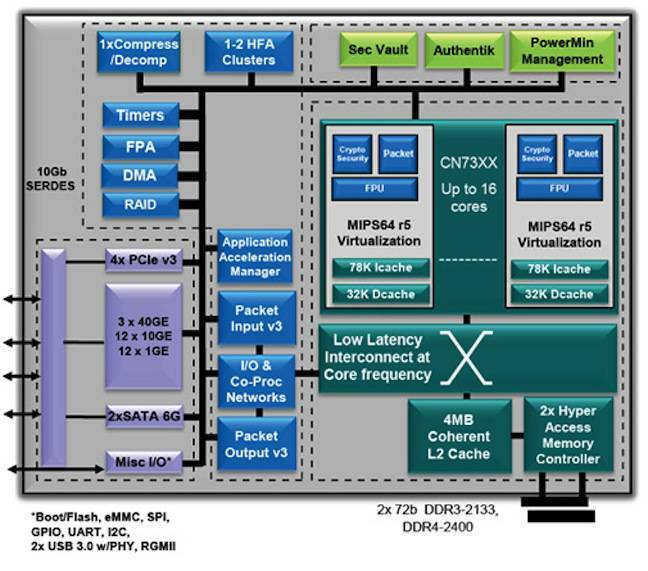 The MIPS64-based SoCs are low-power network processors pitched between the one-to-four core CN71xx and the 24-48 CN78xx range. The chips can be configured down to as little as 8 watts, and there's application acceleration for security, DPI, compression and packet processing work. The company wants to pitch the chips into applications like networking and security appliances, storage, wireless infrastructure, switches and routers. The statement out of Cavium's cannery highlights compute performance and packet processing as key aspects of the new SoCs. The company claims application processing of 40 Gbps, and the 22 serialiser/deserialisers cover Ethernet from 1 Gbps to 40 Gbps, plus PCIe v3 and SATA 3.0. The chips also claim 35 GHz of compute and 120 Gbps of network traffic in the 16-core configuration. The packet processing, Cavium says, is designed to give line-rate performance for MPLS, NVGRE and VxLAN protocols, with capacity to run traffic shaping and QoS. Onboard crypto includes SHA3, and the chip can run IPsec at 40 Gbps. The SoC's deep packet inspection, the company says, can handle millions of flows in real time.